Mike and I had likely picked Morchella snyderi, a common morel species in the region, says Lori Carris, a mycologist in Washington State University’s plant pathology department and an avid morel hunter. But for Carris, there’s nothing common about morels. “These are one of the most iconic of our wild edible mushrooms and yet we know virtually nothing about them,” she says. 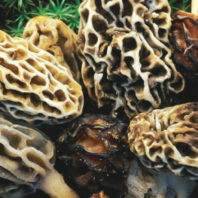 Morchella mushrooms, or morels, are one of the most coveted wild spring mushrooms for gourmands and chefs. Found in North America and Europe, they are traditionally divided into black morels, common or yellow morels, and half-free morels. They typically are found April through early June in woods and in burned over areas the year after a forest fire. Even though the culinary pleasure of the delicious fungi has been known for centuries, Carris says the last few years have yielded research, both her own and others, about morels and shed some light on the mysterious mushrooms. “The life cycle of morels isn’t even fully understood,” she says. When Carris was leading a field excursion in the Idaho woods near Pullman in fall 2011, she stumbled on white fungal growth on moss. Since she couldn’t identify it, Carris took a sample back to the lab and identified it under the microscope. To her surprise, she had become the first researcher to connect the asexual stage of morels in the wild to fruiting morels. DNA evidence later confirmed her analysis. Outside of WSU research, Michael Kuo, an English professor at Eastern Illinois University and amateur mycologist, classified the taxonomy of morel species in North America in 2010. USDA mycologist Kerry O’Donnell in his 2010 study of morel biogeography and distribution found that the center of diversity in American morel species is the Pacific Northwest. Another surprise for some is that morels don’t just grow in the woods. Tobin Peever, also a WSU mycologist, teaches a graduate-level class on fungal biology, primarily focusing on mushrooms. Graduate students in Peever and Carris’s 2014 class researched urban and landscape morels for their class project. They found flushes of morels in Pullman parks and even around WSU’s buildings, including an unidentified and possibly new species. WSU graduate students Andrea Garfinkel, Sean McCotter, and Teresa Jardini found that a number of morel varieties thrive in nonforest settings. They published their research in mycology journal Fungi last fall. Carris and Peever connect with morel experts all over the world on these new inquiries into morels—some of them hobbyists in completely different fields, such as Phillipe Clowez, a French pharmacist. In France, pharmacists are often called on to identify wild mushrooms. Although they enjoy the research, Carris and Peever both started seeking morels in earnest when they moved to the Northwest over 20 years ago. Carris also teaches community classes on mushroom hunting. One thing she emphasizes for novices seeking any mushrooms: Learn from an expert, and don’t eat fungi you don’t know. While most people like me, Carris, and Peever seek out morels for personal use, there are commercial morel foragers. Morel mushrooms can’t be cultivated, with the exception of an unusual landscape morel first described from Mexico, Morchella rufobrunnea. While it’s free to collect some morels for personal use, permits are required in some national forests. Competition is often fierce among commercial pickers, but recently wildfires and warmer temperatures have brought bumper crops of morels. In some years they fruited earlier and lasted longer than Carris can remember. That’s good news for morel fans. More morels means more ways to try out the unique and flavorful fungi. Many people, including Peever and Carris, like to eat morels prepared simply, such as cooked with scrambled eggs, or like my friend’s mom’s tempura-like mushrooms. Just don’t eat them raw. Morels also taste delicious in light cream or wine sauce and served in pasta or on salmon. They can be stuffed with cheese, crab, or other ingredients. Carris says dried morels retain excellent flavor even when rehydrated months later for soup or other dishes. Morel recipes are often served with some sort of meat or animal product. Yet this is an easy creation that lets nonmeat eaters enjoy the fresh fungi as well. Replace the butter with olive oil for a truly vegan recipe. Melt the butter in a skillet over medium heat. Add the shallot pieces, garlic, morels, and asparagus. 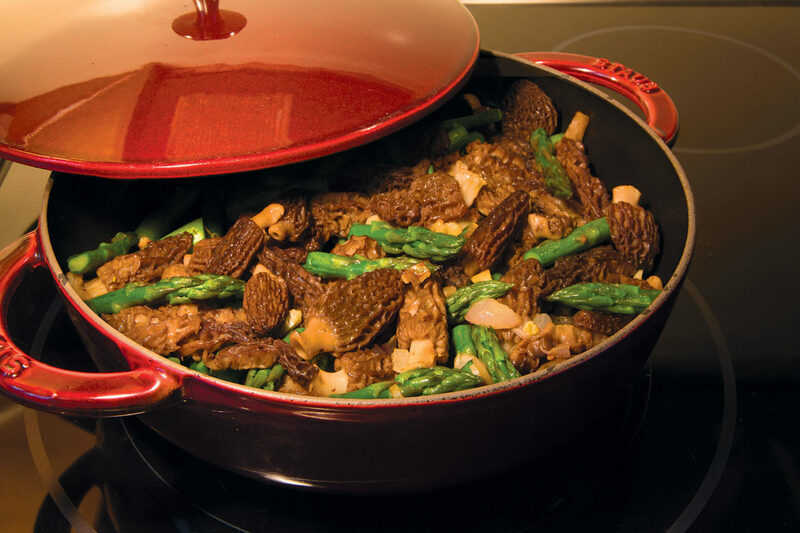 Cook until the morels are browned and the asparagus is tender, usually 8 to 10 minutes.